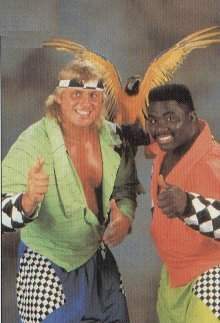 May 2, 1992 – Superstars: High Energy (Koko B. Ware & Owen Hart) defeated Duane Gill & Tom Bennett. May 10, 1992 – Wrestling Challenge: High Energy (Koko B. Ware & Owen Hart) defeated Barry Hardy & Duane Gill. June 6, 1992 – Superstars: High Energy (Koko B. Ware & Owen Hart) defeated Kato & Kevin Krueger. June 21, 1992 – Wrestling Challenge: High Energy (Koko B. Ware & Owen Hart) defeated The Executioners (Executioner #1 & Executioner #2). July 4, 1992 – Superstars: High Energy (Koko B. Ware & Owen Hart) defeated Bob Bradley & Joe Milano. July 12, 1992 – Wrestling Challenge: High Energy (Koko B. Ware & Owen Hart) defeated Joe McMullen & Kerry Davis. August 2, 1992 – Wrestling Challenge: High Energy (Koko B. Ware & Owen Hart) defeated Duane Gill & The Dublin Destroyer. September 13, 1992 – Wrestling Challenge: High Energy (Koko B. Ware & Owen Hart) defeated Bob Bradley & Louie Spicolli. October 10, 1992 – Superstars: High Energy (Koko B. Ware & Owen Hart) defeated Brian Jewel & Ken Johnson. October 25, 1992 – Wrestling Challenge: High Energy (Koko B. Ware & Owen Hart) defeated Bill Lyons & Bob St. Laurent. November 7, 1992 – Superstars: Money Inc. (Irwin R. Schyster & Ted DiBiase) defeated High Energy (Koko B. Ware & Owen Hart) to retain the world tag team titles. November 25, 1992 – Survivor Series: The Headshrinkers (Fatu & Samu) defeated High Energy (Koko B. Ware & Owen Hart). December 5, 1992 – Superstars: High Energy (Koko B. Ware & Owen Hart) defeated Barry Horowitz & WT Jones. January 30, 1993 – Superstars: High Energy (Koko B. Ware & Owen Hart) defeated Chuck West & The Brooklyn Brawler. February 1, 1993 – RAW: High Energy (Koko B. Ware & Owen Hart) defeated Iron Mike Sharpe & Von Krus. February 7, 1993 – Wrestling Challenge: High Energy (Koko B. Ware & Owen Hart) defeated Dale Wolfe & Ken Johnson. February 21, 1993 – Wrestling Challenge: High Energy (Koko B. Ware & Owen Hart) defeated Money Inc. (Irwin R. Schyster & Ted DiBiase) by disqualification. Schyster & DiBiase retains the tag team titles. 1993: Owen Hart suffered a knee injury, and when he returned, Koko B Ware was gone from the WWF..